SFW123GTC Digital Fire/Water Safe is rated 4.3 out of 5 by 24. The SFW123GTC is designed with you in mind. Built to safeguard your valuables with UL Classified fire protection and ETL Verified flood protection, this safe is the ideal storage solution. 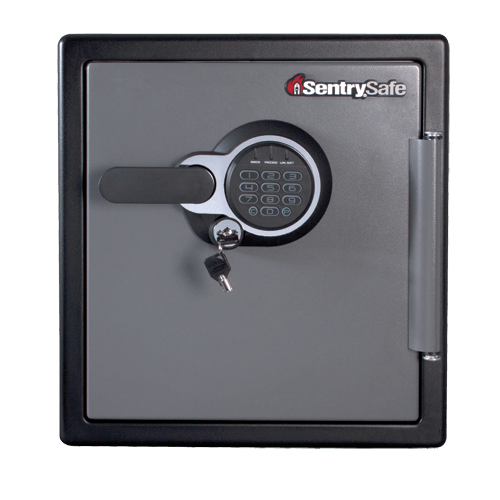 If your safe goes through a fire, SentrySafe will send a replacement safe free of charge, so the things that matter most are protected for generations to come. Rated 5 out of 5 by GuitarGuy from Just what we needed It really is just what we needed. Big enough to hold all our important papers. Small enough to easily conceal. Digital lock is a big plus making it very easy to get into quickly when we need to. The internal light is a great feature. The drawer is very handy for smaller items and boxes. I saw some You Tube videos showing how easy it is to get into, and it's not going to stop a professional - nothing will. But it will deter the "casual" opportunistic thief. The Safe Store employee tried to tell us it's easy to get into, but then again he admitted that even his more expensive brand safes were equally as easy. They certainly weren't worth 2 or 3 times the cost. We are overall very happy with the safe. Rated 1 out of 5 by Derek from Worthless Paper Weight I opened the box after lugging this 80lb brick up my stairs only to find no owners manual, no combination, no key, no anything besides screws to bolt this to the floor. I cannot open this thing! To make matters worse, SentrySafe does not have weekend customer support. Wish I did not purchase this thing!! Rated 3 out of 5 by Richbeaker999 from Nice look Packaged nicely. There was a small dent on the safe when we opened it but where we put it it was not visible. When anchoring to the floor the marks on the feet were not symmetrical. Overall it operates as described. When closing the door you need to push hard since it is water safe. Rated 4 out of 5 by DavidC from Good safe--lots of room! 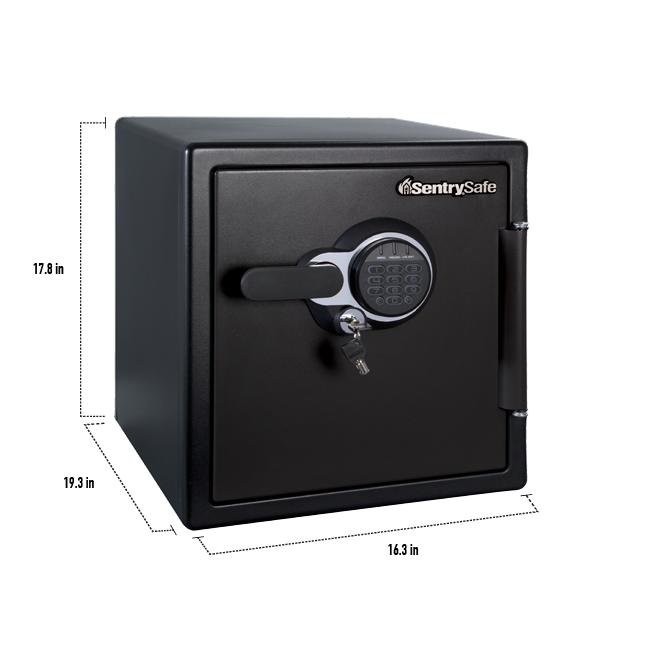 I bought this safe after upgrading my Sentry safe to a fire protected one. I like it a lot. Very heavy about 100 lbs roughly. Comes in a good tight box which is not too bulky so easy to carry with one strong individual. Easy to set up code. Takes 4 AAA batteries and has fairly good interior lighting. I like the deep tray that comes with it and ordered an additional one on line. In some ways I wish the key was an over ride and not just an additional lock mechanism, but since the factory code can never be deleted and I registered my code on line I can be assured the push button system will be fine alone. The push buttons are nice quality and look good with back lighting. My only negative would be, the door handle (although hard plastic and likely durable) seems cheap and could break easily if hit by accident. I would definitely have recommended that the company put a rubber or hard neoprene around it to give it a little more handle grip and feeling of durability or quality. 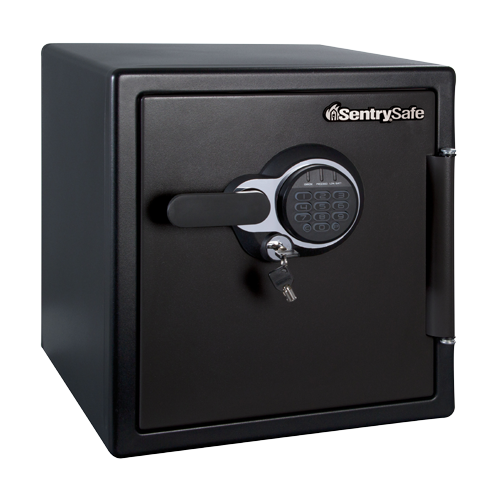 Otherwise--very nice safe and Sentry of course is the leader. Rated 5 out of 5 by MzLinda from Great Price for Peace of Mind This safe gives me peace of mind knowing my important documents and valuables are secure. I also love that I can lock the keypad as added security for when I'm away. I highly recommend. 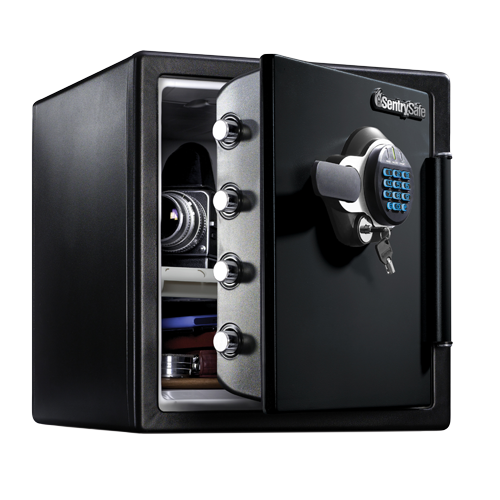 Rated 5 out of 5 by Wendy 57 from Security Having the safe gives me a sense of security for my important documents. The shelf is a nice feature to allow for organization. The fact it can be bolted down is also a great feature.